New Release. Price £350.00 + FREE Mainland UK Delivery. Made from a blend of the finest Chardonnay, Pinot Noir and Pinot Meunier grapes, Brut Majeur is the epitome of a non-vintage brut from a great, historic House. Extended ageing in cellars and a low dosage make this wine suitable for any occasion; it is the finest ambassador for the House's freshness and elegance. Pale gold in colour with a fine mousse, the wine is aromatic on the nose. On the palate, it is well balanced and shows great finesse and complexity. Pinot Noir gives the wine richness and a long finish while Chardonnay, from the finest soils of the Cote des Blancs, adds delicacy, liveliness and freshness. Pinot Meunier, mainly from the Marne Valley, gives the wine an appealing fruitiness and roundness. Delicious as an aperitif, Brut Majeur is also the perfect wine to serve throughout a meal. It will pair perfectly with sea food, scallops, lobster, crab, fresh or grilled fish, fish terrines, salmon or beef carpaccio. Brut Majeur also goes along extremely well with white meats, hot pot ('potée champenoise') and white pudding ('boudin blanc'). Cheeses : Soft and mouldy cheeses such as Boursault, Coulommiers, Chaource, Brie, Brillat-Savarin. Desserts : Major parings include crumble with red berries or figs, fruit-based desserts (apple, pear or peach tarts), almond paste, frangipane pastries such as the French 'Galette des Rois'. One of the original 26 Grand Marque Champagne Houses, Ayala has had a noble history since its inception in 1860 when Edmond de Ayala received the magnificent Chateau as the dowry for his wedding. 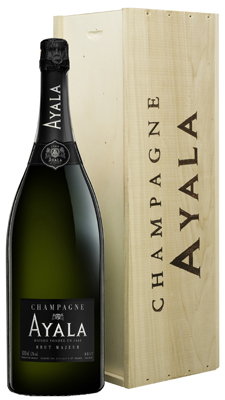 Located in Ay, in the heart of the Montagne de Reims vineyards, Ayala naturally focuses on Grand Cru Pinot Noir for its Brut Majeur and its Vintage Brut. Ayala is a "small" house, the artisan of champagne-making. "This is brilliant: a beautifully balanced, precise champagne with delicate toastiness and citrus fruit. Intense, complex and fresh, and by champagne standards, a bargain." "Broad, expressive nose - lots of yeastiness on display, plus spice, floral and some toffee and caramel notes. The palate is clean and precise, showing elegant fruit characters and some burnt biscuit flavours too. Classic Champagne style, very conventional but decent complexity."